I swear I've seen this one before. New Zealand maybe? Anybody remember? I have this other pic of the same car... Southwards museum in New Zealand... terrific memory, A.J.! For some reason it only works with cars. Picture from 1982 Classic Car Meet. Owned by R.P. Loecher Denver Colorado. An ad from 1964. Car owned by Conrad Lowery in California. Price was 425.00. A period picture in Europe. Are the headlights modified? Note the semaphores (turn signals) on sides of windshield posts. Hi. This is a picture from a car show in Sweden in the late sixties. 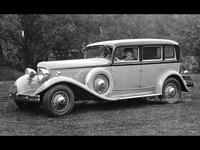 The car is also on a couple of pictures in the European royales post. He lives in Nevada and owner of a little car museum. 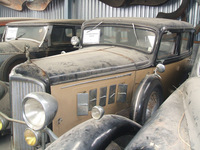 We're located in Belgium and sell our 1932 Reo Royale 835 Sedan. This car has been completely and professionally restored here in Belgium. No costs have been spared to achieve this result. The car's chassis and underside is as shiny as the body and interior. Not one piece or bolt hasn't been taken care of. This car has almost never driven since as my dad wanted it to stay in this mint condition. On request we can send you more details and pictures. We have full photo coverage of the restoration, as well as the complete car history. What's unique for this car is that prior to us from 1932 to 1993 (about 60 years) it only had 4 owners. This car stayed all these years in the Fresno (CA) area till we shipped it to Belgium. Now we're looking for a new owner who can continue the history of this car and give it the LTC it's used to have. My brother and I can't find the time to do it.